– Lentil crackers with potatoes, chickpeas, topped with a tongue tickling combination of yogurt, mint & tamarind chutney. – Specialty of Bombay-a tangy tongue tingling appetizer with crushed potatoes, onions, sev, chutney and a puffed rice base. – Crispy puffed lentil crackers stuffed with spiced potatoes or ragda and served with spiced water. – Lentil crackers with potatoes, chickpeas, topped with a tongue tickling combination of mint & tamarind chutney. – A delightful combination of potato patties & chic peas cooked on a hot plate (Tawa). – Samosas finished with chickpeas, topped with lip smacking combination of yogurt, mint & tamarind chutney. – Batter fried cottage cheese sautéed with hot chilies and garlic to the perfection. – Fried Florets of gobi (cauliflower) sautéed with finely chopped coriander, green chilly, ginger, garlic and onions to perfection on a high flame. – An appetizing deep fried green vegetable patty. 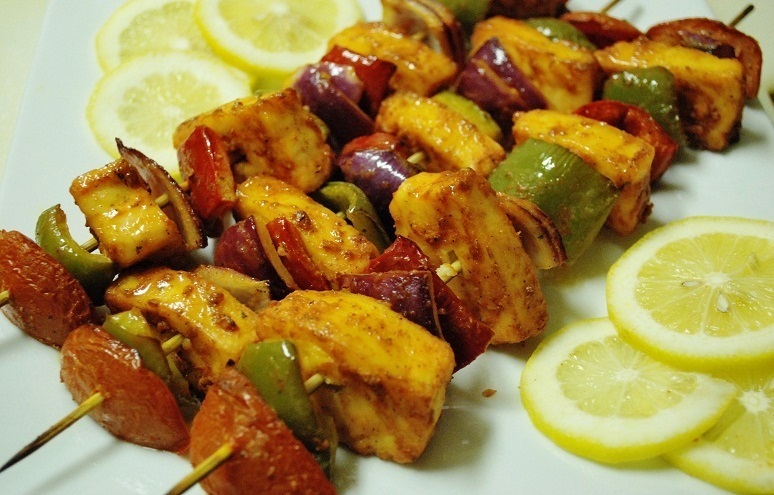 – Cubes of cottage cheese, capsicum, tomatoes & onions grilled in a tandoor. – Mint & Coriander chutney sandwiched in cheese, batter fried. – Crisp lightly spiced vegetable fritters of potatoes, onions, cauliflower and eggplant. – Succulent rice cakes, soft and fluffy served with coconut chutney and sambhar.